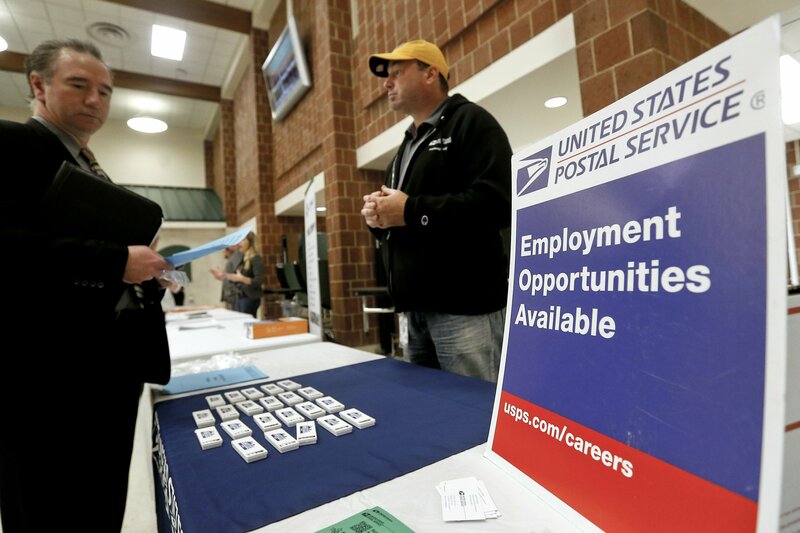 WASHINGTON — Even with fear of a global economic slump depressing stock markets, Friday’s jobs report for December is expected to offer reassurance that the U.S. economy remains sturdy and on track to expand for a 10th straight year. Economists have forecast that the Labor Department will report that employers added a solid 180,000 jobs last month and that the unemployment rate stayed at a five-decade low of 3.7 percent, according to the financial data firm FactSet. The expectation of continued strength in hiring would contrast with the chaos of the stock market, a raging trade war, a partial shutdown of the government and the perception of growing risks for the economy. But the expected continuation of steady job growth suggests that such risks might be — for the moment, anyway — overblown. Average hourly earnings are expected to have climbed 3 percent from a year ago, up from a year-over-year gain of 2.7 percent at the end of 2017. Payroll processor ADP said Thursday that private businesses added a robust 271,000 jobs in December, a sign that companies expect decent growth to continue despite the overhang of risks. And businesses are still searching for more workers. The employment site Glassdoor found that job postings have risen 17 percent in the past year to 6.7 million. “We really don’t see any slowdown yet,” said Andrew Chamberlain, chief economist at Glassdoor. Hiring has been unusually strong as the unemployment rate has fallen to 3.7 percent — a 49-year low — from 4.1 percent at the start of 2018. Economists estimate that it requires roughly 100,000 job gains each month to satisfy population growth and keep the unemployment rate at its current level. But hiring has easily eclipsed that pace. During the first 11 months of 2018, employers added 2.27 million jobs, or an average of 206,182 a month, according to the Labor Department.